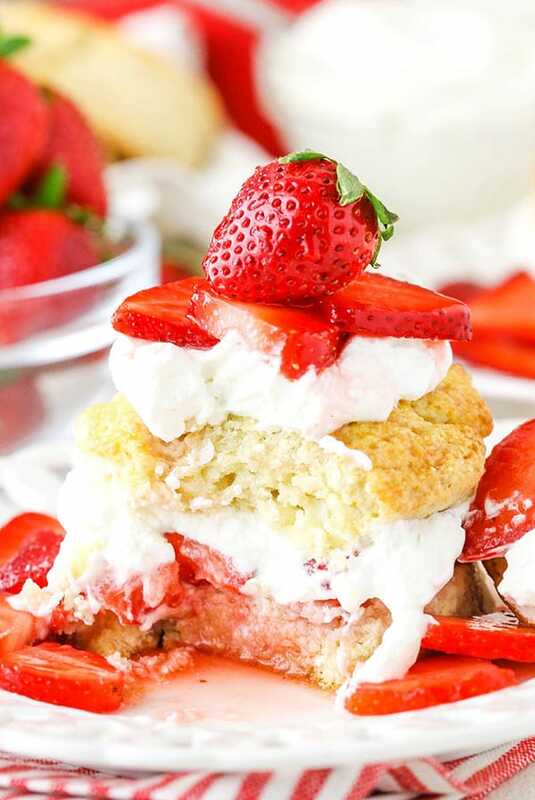 This Easy Strawberry Shortcake Recipe is as simple as it gets – homemade shortcake biscuits, juicy strawberries and homemade whipped cream! 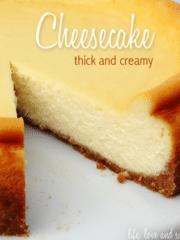 A classic dessert that’s perfect for summer! Even though strawberries are usually best during the spring and summer, we’ve been getting great strawberries for months around here. A little nutty, but also wonderful! Strawberries are easily one of the hubs and I’s favorites, so naturally the twins are big fans too. We are constantly buying them and boy do they smell good! 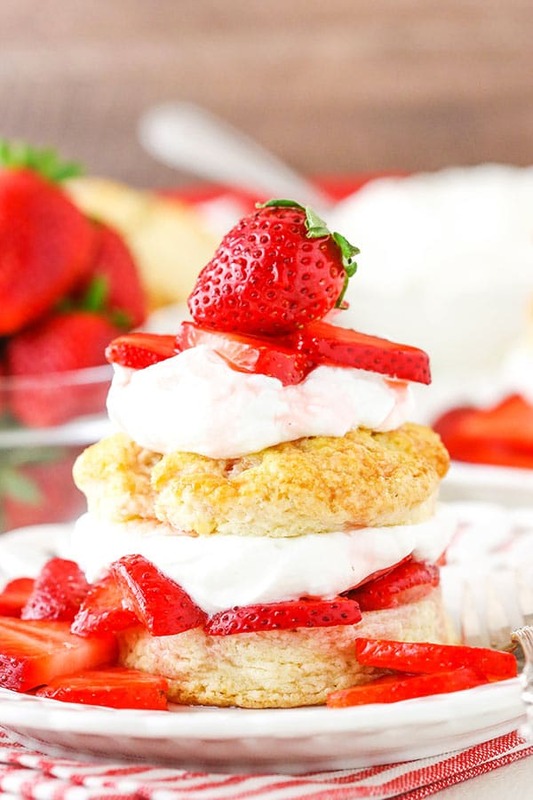 And with so many delicious strawberries around, strawberry shortcake is a must! The boys don’t really eat things like shortcake or biscuits yet, but when they start, these will be a regular for us during the summers. 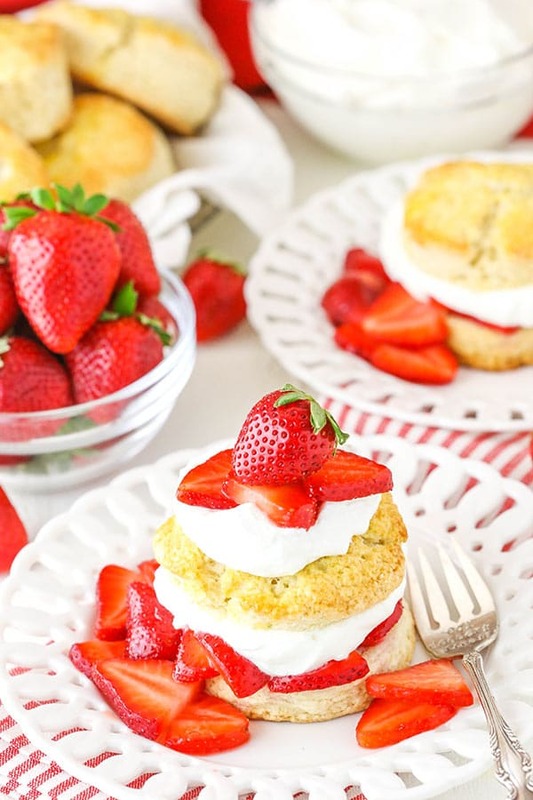 How can you beat fresh strawberries, whipped cream and biscuits?! Especially when they are so simple to put together. To get started making strawberry shortcake, you’ll put together the strawberries. The recipe calls for one and a half pounds of strawberries, but you could always have more on hand. The more, the merrier! Slice up those strawberries, sprinkle on the sugar and stir it all together, then set them in the fridge to get all nice and juicy. 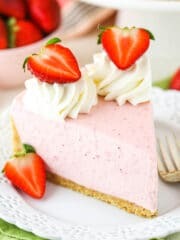 While it may be tempting to reduce the sugar a bit here, you really want to be sure to use enough sugar to macerate the strawberries – bring out the juices. The sugar draws out the moisture, so reducing it will also reduce the amount of strawberry sauce you end up with for your biscuits, which would be sad. 2. Cut the butter into the dry ingredients. 3. Add the cream and egg. 4. Cut the biscuits out. That’s it! Simple ingredients, simple method, delicious biscuits. 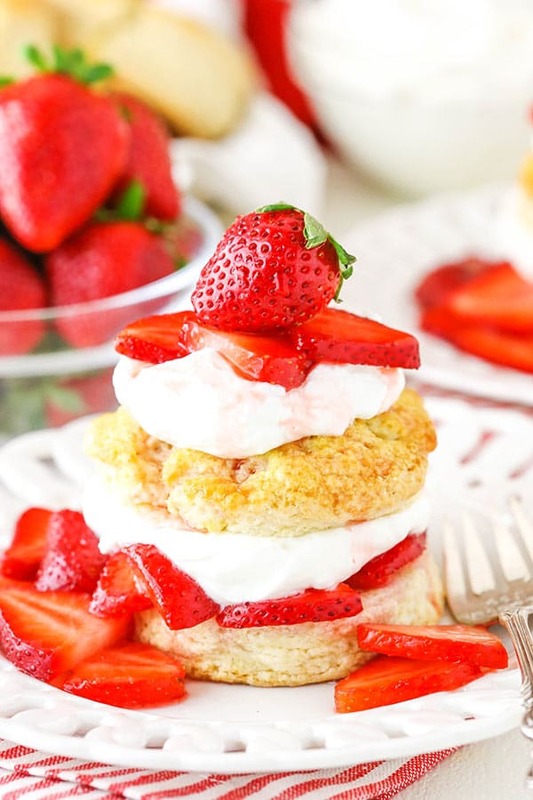 Now you can find a lot of variation between shortcake/biscuit recipes, so let’s talk about this one a little bit. 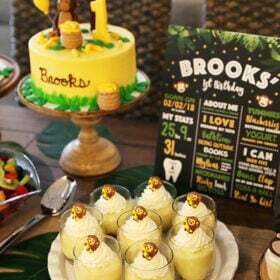 There’s the more cakey shortcakes and the true biscuit shortcakes. I personally like a little bit of a combo. I don’t want something so cakey that it’s not a biscuit, but also not something so like a biscuit that it doesn’t feel like dessert. 1. An egg, for just a smidge of “cakeyness” without being too much. 2. Vanilla extract, for excellent flavor. 3. Sugar, also for flavor both in the biscuit and on top. Now if you’re really into a more cakey biscuit, you could add a little more cream and get there, but I find these are just right. 1. Don’t over mix the dough or you’ll end up with tough, flat biscuits. 2. When cutting them out, press straight down and don’t twist the cutter. Twisting will mess up the layers and they’ll bake/rise funky. 3. Dip the cutter in some flour before cutting each one out to prevent sticking. Next up is the homemade whipped cream. It doesn’t get much better than this. And if you haven’t made homemade whipped cream before, you are totally missing out. I grew up on the store-bought stuff, but I’ve since learned that homemade is the way to go. 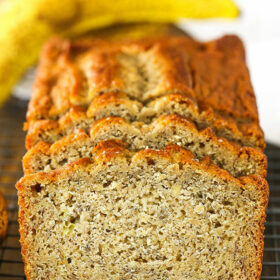 SUPER easy and so much more delicious! To make your whipped cream, add the heavy whipping cream, powdered sugar and vanilla extract to a mixer bowl and whip on high speed until medium to stiff peaks form. It’s that easy! I’d suggest making the whipped cream shortly before serving so it’s fresh, but this whipped cream will be stable. So, if you wanted to make it ahead, you totally could. 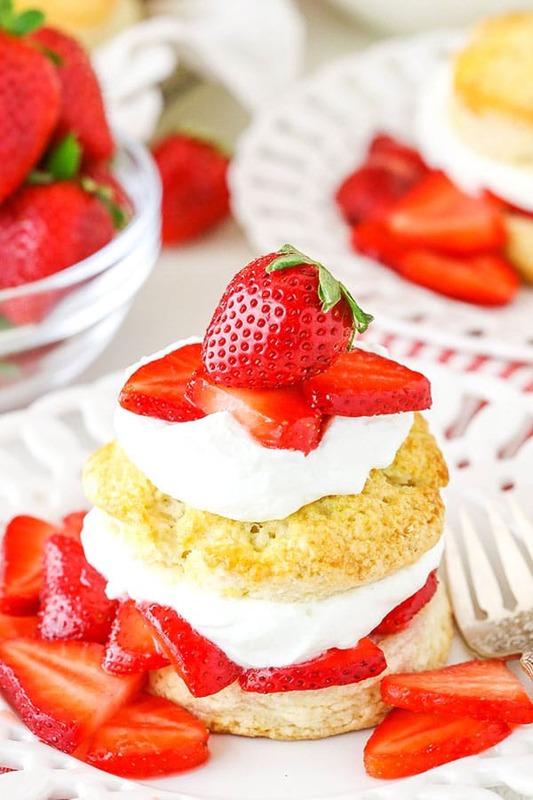 To assemble the shortcakes, just slice the biscuits in half horizontally and fill with plenty of strawberries and whipped cream! 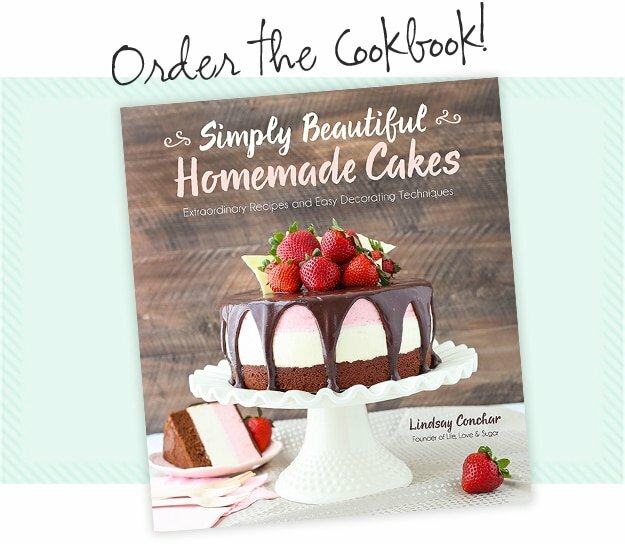 Get really crazy and add even more strawberries and cream on top! One of the best things about this dessert is that assembly is so easy and everyone can make their own however they like. Just put out the biscuits, berries and whipped cream and let everyone go to town! These strawberry shortcakes are wonderfully delicious, fresh for summer and easy to put together. Such a crowd pleaser too! 1. To prepare the strawberries, toss them with the sugar to combine and let sit for at least 2 hours to draw out the juices. 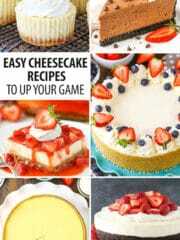 These can be made the night before using, if you like. The longer they sit, the more juices are drawn out. 2. To make the biscuits, preheat the oven to 375 degrees. 3. 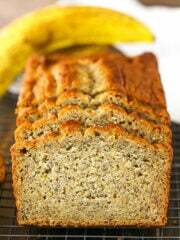 Combine the flour, baking powder, sugar and salt and whisk together. 4. Using a pastry cutter or a fork, cut the cold butter into the flour mixture until course crumbs are formed. The largest butter pieces should be about the size of small peas. 5. Combine the one cup of heavy cream, egg and vanilla extract. Pour the cream mixture over the flour mixture and stir together just until it starts to come together. Do not over mix. 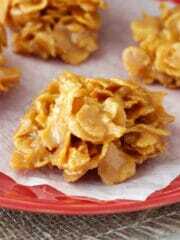 Mixture will still be crumbly. 6. Turn the dough out onto a lightly floured surface and gently bring it all together to form a ball. Gently flatten out and then fold in thirds, folding the left side over onto the middle, then the right side over onto the middle. Lightly pat back out into a square about 1 inch thick. 7. Using a 2 1/2 inch biscuit cutter, cut out the biscuits. Gather together the scraps, fold together once and pat back into a square to cut out remaining biscuits. You should be able to get 7-9 biscuits. Dip the biscuit cutter into flour between cuts, to keep it from sticking. When cutting out the biscuits, press straight down. Do not twist. 8. Place the biscuits on a parchment lined baking sheet at least 2 1/2 inches apart. 9. Combine the other egg and 1 tablespoon of cream and brush the tops of the biscuits with the egg wash. Sprinkle the tops with some coarse sugar. 10. Bake the biscuits for 17-20 minutes, or until the tops are golden brown. 11. 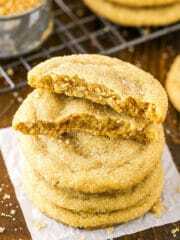 Remove the biscuits from the oven and allow to cool on a wire rack. Serve warm or at room temperature. 12. When ready to serve, make the whipped cream. Add the heavy whipping cream, powdered sugar and vanilla extract to a large mixer bowl and whip on high speed until medium to stiff peaks form. 13. 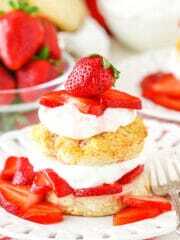 Cut the biscuits in half horizontally, then fill with strawberries and their juices and whipped cream. For a more cakey version of the biscuit, add 1/4 cup of additional cream to the biscuits. Be aware that they will spread more when baked. This recipe modified from Martha Stewart. Strawberry Shortcake is an absolute favorite of mine. I can’t wait to make this!!! I don’t have a biscuit cutter though. Have you any suggestions of something else I could use in its place? 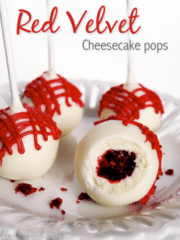 I would grab one from Bulk Barn because once you make them, you’ll want to make them again. They’re cheap there or Walmart. If you have a small pot, maybe use the lid to cut them or if you had a small bowl, or small plastic cup. Anything that is round would almost work. I’m not really sure – a round cookie cutter? The suggestion for a can is an interesting one. If the edges are straight and sharp, it could work. But if you can get a biscuit cutter, that’d be best. A quick sharp cut is going to give the best cut layers for a good biscuit rise. I hope you enjoy them! If you don’t have a biscuit cutter, the next time you open a can of vegetables, cut both ends from the can. make sure there are no sharp edges. I have a biscuit but like “the can” better because it is so easy to hold. 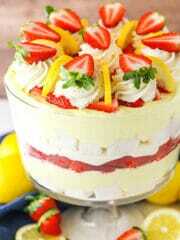 Lindsay, this shortcake has really tender crumbs and it looks delicious. My family loves Strawberry shortcake anytime!